I wanted leggings like this all winter -- not super shiny (I already had those), but with just a sheen. This week I scored some on sale at Urban for $5. Now it's almost too hot for them during the day, but I got at least one use with this look! I paired them with a long tank (for bootie coverage), wide leather belt, patterned lightweight scarf and white sandals. I look rather serious in this photo, but don't let my expression fool you. Despite a nasty toothache, I'm in a happy mood on this lovely Sunday. Sporting a colorful get-up with a South-of-the-border feel: my embroidered tunic from Mexico, a turquoise mini and gladiator sandals. I felt a bit bohemian but still pulled together today in a roomy dolman-sleeved blouse, two-tone cotton skirt and gladiator sandals. A breezy look to greet a gorgeous weekend. Today I paired this cherry-print blouse with a form-fitting denim pencil skirt. Button-ups that tie around the waist are such a playful look for spring and summer. Worn with high-waisted shorts and skirts, they have a great retro feel. And you can get the look with any button-up. Just leave several of the bottom buttons undone and tie the loose ends. Today I sported some items from yesstyle.com purchased with the gift certificate I won for the weardrobe florals contest. This jumpsuit was a somewhat risky online selection, but I'm totally digging it. I have a couple of rompers, but this is my only full-fledged jumpsuit. This is also my first foray into harem pant territory. I must say I got some weird looks walking around in this outfit. Perhaps Kansas isn't ready for the quirky trend overload, but I don't care. While some might consider it frumpy, I felt cool, laidback and urban in this look. The jumpsuit is getting all the attention, but my new gladiators musn't be overlooked. I'm in love with them and think they will be my summer staple shoes. Thanks a million to yesstyle.com and weardrobe! Today I helped a lot of friends celebrate graduation (congratulations, guys! ), so I needed a fun, comfortable outfit. 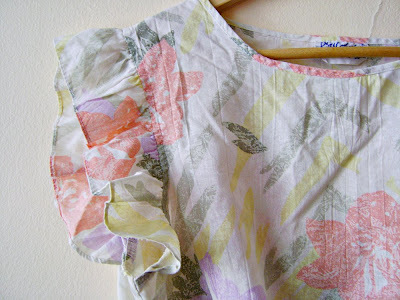 I rediscovered this vintage nightgown in the depths of my closet and wore it with my full denim mini-skirt and a pair of simple flat sandals. What's hot right now besides bold, bright shades? A complete lack of color, apparently. After seeing all-white looks popping up all over the place, I decided to give the achromatic aesthetic a shot. My "matchy-matchy" radar was blaring, but I guess when it's all white, those rules don't really apply. In keeping with the minimalist feel, I skipped accessories (besides the Clubmaster-inspired shades). Remixing some favorites: my floral skirt worn as a top and these woven yellow sandals I just can't get enough of. While it's tempting to sport the ruffly dress for my Friday night out, here's what I'm actually wearing. A big gray tank, dark wash skinnies and peep-toe platform booties make for a casual look with edge. My patterned scarf (again! ), big silver earrings and metal bangles complete the look. 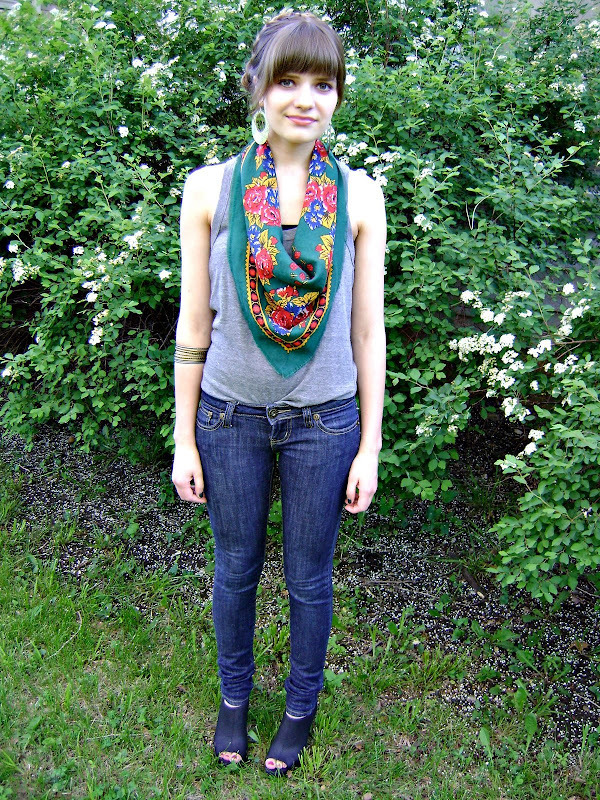 I'm loving lightweight scarves as a spring accessory, so you'll probably continue to see this one often. 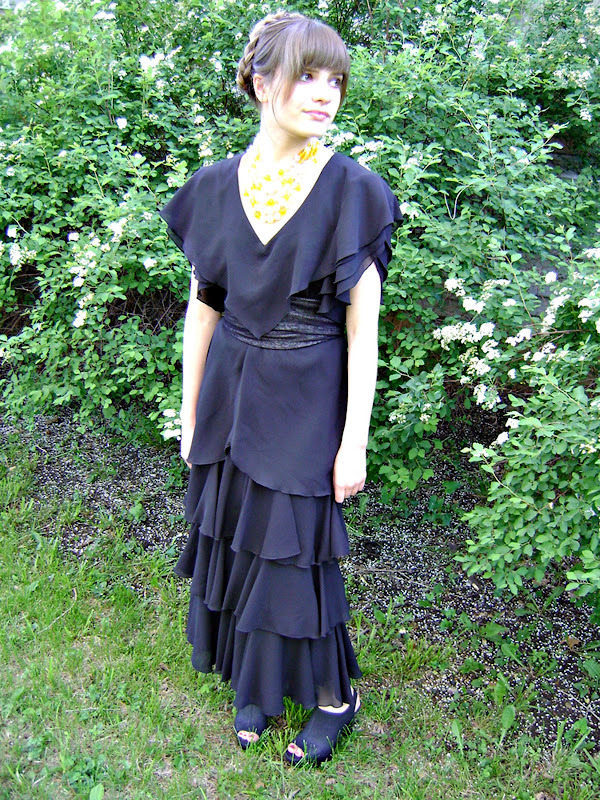 I recently acquired this dramatic tiered ruffle formal for my Esty shop and for some reason have developed an attachment to it. This isn't how it's "supposed" to fit, but I like the way it looks. I feel like my head is in the clouds, though, as I cannot think of when my unglamorous life will give me occasion to wear it. There are no galas on the horizon. So what do you guys think? Should I indulge my silly fondness of this dress, or share the love in hopes it will find a better owner? Today was steamy, and I was not at the office, so I let loose with my girly summer style. I love this short denim skirt, but I'm concerned that it's too scandalous without tights. Maybe in combination with the bare shoulder, I was feeling a bit exposed. Once the heat of real summer rolls around, any inhibitions will be out the window. I typically discourage wearing looks that are completely vintage-inspired to avoid looking hokey or costume-like, but the mood struck me on this sunny afternoon to do just that. 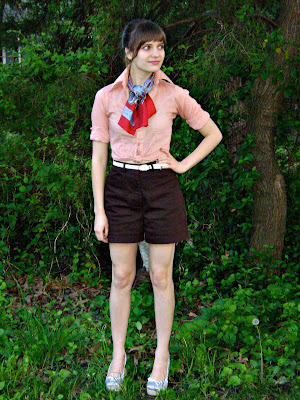 Sporting my high-waist shorts, button-up with popped collar, neck scarf and seersucker espadrilles, I channeled the style of Mad Men's Helen Bishop (the outcast divorcee who often wears pants). This look boasts a killer combo: style and practicality. The top is actually a form-fitting dress, so it stays put. Constantly fussing with a tucked-in shirt is so annoying. The skirt is a recent thrift store find that I think will be quite versatile. It has an elastic waistband, which makes it a comfy choice for sitting at my desk all day, and I can wear it higher/shorter (for a flirty weekend look) or lower/longer (for office propriety). I'm loving high-waist full skirts: they're flattering and great for twirling. Also, my nails are finally decent! I bought two bottles of polish: gunmetal gray for fingers and a pretty iridescent berry shade for my toes. I'm still mastering my technique, but it's a vast improvement. Boyfriend blazers are a chic way to transition from cool to warm temperatures, and they're easy to find at thrift stores. On this chilly casual Friday, a vintage Levi's blazer adds a tailored touch to jeans and a tee. A neck scarf and peep-toe oxford pumps finish the look. 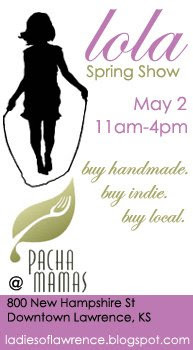 If you live in the area, don't miss the LOLA Spring Show on Saturday at Pachamama's! These ladies always have the hippest handmade items for sale. Check out their blog for more details.